I began researching this article several months ago, and in doing so, stumbled across another story about cold war intrigue and the death of a president. Research is like that, you never know exactly what will turn up or where the information trail will lead you. In any case, Comanche was the first horse to receive a full military burial with honors. The second horse to receive such honors was Black Jack but that’s another story. Comanche was not General Custer’s horse as legend and songs would have you believe. The horse became the property of the US Army in 1868 when the animal was purchased in St. Louis, Missouri. 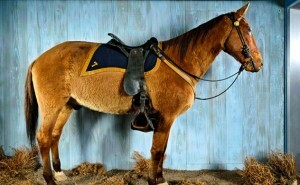 Shortly afterward, Captain Myles Keogh of the 7th Cavalry bought the 15 hand, buckskin gelding. The horse became his personal mount. While stationed in Kansas to fight in the Indian Wars, Keogh’s new horse was wounded by an arrow. The horse made a sound like a Comanche war cry but continued to carry Keogh in battle. Subsequently, he renamed the horse Comanche. In the spring and summer of 1876, Hunkpapa Lakota holy man, Sitting Bull, organized a gathering of Plains Indians at Ash Creek, Montana. By June, the meeting place moved to the Little Bighorn River. The encampment united Lakota, Northern Cheyenne and Arapaho Indians. They came to discuss how to deal with whites in search of gold in the Black Hills and the Indian’s forced removal from tribal homelands to reservations by the US Calvary. On June 24, 1876, Custer set out to engage the Indians in combat at the Little Bighorn. Custer divided his men into three battalions. Major Marcus Reno and Captain Frederick Benteen each headed a battalion while Custer led the third. The three battalions set out to encircle the Indian camp; Custer attacking from the north. Things did not go as planned for Custer and his men. The Native Americans wiped out Custer’s battalion to the last man and captured their horses. 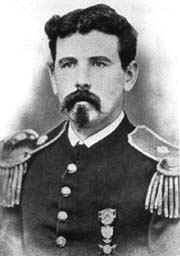 Captain Keogh was killed and his horse Comanche lay in a ravine badly wounded. Two days after the battle Sergeant DeLacey of Company I and his men found the injuried horse; the only survivor on the battlefield. Keogh’s body sustained a bullet wound to the left knee which corresponded to a wound through the chest and flank of Comanche. This fact lead observers to conclude that horse and rider fell together in battle. Although badly wounded Comanche was able to stand. He was taken aboard the steamer, the Far West, and transported back to Fort Lincoln in North Dakota where he recovered. Comanche’s injuries were extensive. He sustained three severe wounds; bullets penetrated the horse’s neck, front shoulder and hind quarters. The remaining four bullet wounds were superficial. After recovering from his injuries, Comanche was retired from active duty. (3.) Hereafter, upon all occasions of ceremony of mounted regimental formation, ‘Comanche,’ saddled, bridled, and draped in mourning, and led by a mounted trooper of Company I, will be paraded with the regiment. Thus Comanche became the lone hero and symbol of the battle at the Little Bighorn. 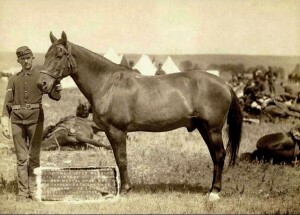 Popularized as the heroic horse of Custer, Comanche, became well known to the public and a legend. In June 1879, Comanche moved to Fort Meade, South Dakota where he was stabled in royal fashion. Eventually, the horse relocated to Fort Riley in Kansas. Twelve years later, Comanche died of colic at the presumed age of 29. He received a military funeral with full honors. The Calvalry officer’s deep affection for Comanche moved them to have the horse stuffed. They contacted Professor Lewis Dyche at Kansas University to preserve the animal. Dyche’s fee was $400 and he retained the right to display Comanche at the 1893 Expostion in Chicago. The professor built an elaborate frame of wood, wire and clay on which to drape the horse’s hide. He finished his work preserving Comanche and waited for payment and transport back to Fort Riley. It is unclear why the professor never received payment for his work; however as the result, Comanche remained at Kansas University Natural History Museum. The stuffed horse traveled to The Exposition in Chicago where it was widely viewed by the public. Currently, Comanche resides in a showcase at the university. It would seem that with time Comanche’s legend would fade; however, Hollywood and the music industry saw things differently. Johnny Horton, country music and rockabilly singer, released ‘Comanche (The Brave Horse) in 1956. The song commemorates Custer’s last stand at the Little Big Horn and Comanche, the last survivor of the battle. Unfortunately, the facts are not totally correct in the song as Comanche was not Custer’s horse but poetic license has a way of clouding reality. David Appel published ‘Comanche: The Story of America’s Most Heroic Horse’ in 1951. The book gave a fictional account of Comanche’s story; narrated by the horse. Walt Disney Productions based the film ‘Tonka’ on Appel’s novel. Released in 1958, the movie featured Sal Mineo and was filmed in Bend, Oregon. And so Comanche’s legend lives on. Other books have been written about the horse’s life and I’m sure new ones will appear in the future. Meanwhile, the stuffed horse remains showcased at the Kansas University Natural History Museum. This entry was posted in Uncategorized and tagged Battle of the Little Big Horn, Captain Myles Keogh, Comanche, Indian Wars, Sitting Bull, Tonka. Bookmark the permalink. Thank for sharing this story, it is very interesting and heartbreaking. I guess it’s just the pet lover in me that wishes for animals to stay alive and be a constant companion. At first, I thought that Comanche is still alive, but when I saw the year, I just told myself, at least he lived a full life. I’m not aware of a horse’s long life span, but 29 years is long. I always liked the idea of having a black horse someday. Feeding, brushing, cleaning, and riding him. I only have one in my sims game, but that doesn’t really count. Hi Cassiopeia, Glad you enjoyed the article. Comanche did have a full life and after he recovered from his injuries was treated like a prince. Hope someday you get that black horse.